There are so many little details that go into a dessert table, and as well, how much it will cost. For example, when is your event? Where is your event? Will the venue have air conditioning? What is your theme? How many guests? Etc. The prices below are a jumping off point for us to begin working towards your vision for your perfect dessert and sweet table. Take a look at the choices and add ons, and let’s talk. Whether it’s preparing a special family recipe, or hearing about your favourites and working it into your theme, let’s make your dream come true! Choose from: Popcorn (buttered, cheese or caramel); royal icing dipped pretzels to match your event theme; any cookies, bars or tea cakes from our Cookies & Bars menu; fruits and dip; piped meringues, chocolate drizzled potato chips, mini cupcakes from our Standard Cake & Cupcake menu. Your choice of 5 cakes from the Standard Cake & Cupcake menu, decorated to coordinate with your wedding colours. 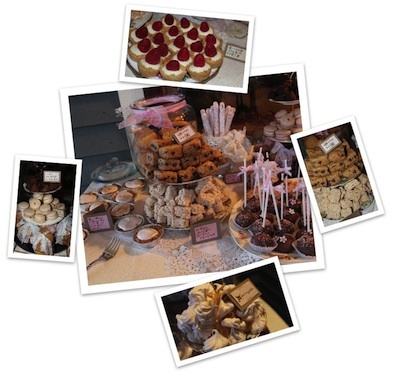 If I’ve created a Dessert Table for your event, I’d love to hear from you! Please leave your comments in the space below, and thank you for your feedback!